Health care, especially in the U.S., is a complicated thing, to say the least. So when I discovered some invaluable health-care information — stuff I was completely unaware of — while doing research on depression (a common symptom of MS), I had to share it here. I was reading the book “Living With Depression: Why Biology and Biography Matter Along the Path to Healing,” by Deborah Serani, which traces the author’s personal struggle with depression, as a patient and as a licensed psychotherapist. It’s a fantastic resource for anyone who’s looking to better understand depression or who’s in the midst of battling the disease. But it’s also helpful for anyone who’s dealing with one of the many other chronic illnesses. This is partly because depression often comes along with other diseases, and partly because the book contains an entire chapter on health-care resources, facts, and tips. I was unaware of most of this information, and I figured I’m probably not the only one. With Deborah’s permission, I’ve included the following excerpts from her book in hopes that it’s helpful to you or someone you know. Another way to obtain free brand-name medication is to contact the pharmaceutical company directly. If you are not eligible for free medication and are paying for brand-name prescriptions, there are some avenues that can help defray costs. 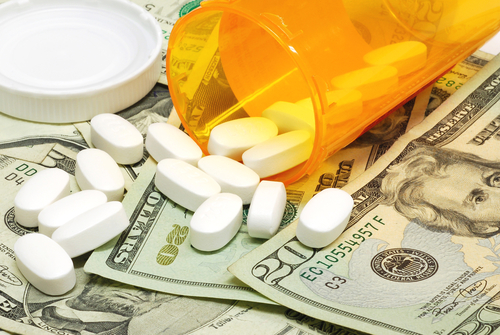 You can ask pharmaceutical companies if they have special discount programs or rebates for your brand-name medication. For example, I take a hypertension medication, which erupted to a $75 copayment under my new health insurance. Astonished, I inquired about this high expense by calling the pharmaceutical company and managed to get a discount card for $25 off each monthly refill for a year. You can look into discount prescription cards, which are made available by organizations independent from insurance companies. For example, Drug Card America, UNA Rx Card, and state Rx cards can be accessed online for immediate coverage; once you fill in your name and address, your card is ready. Click, print, and begin using it at cooperating pharmacies. My local pharmacies, Target and CVS, both participate — which makes me happy and pocket-change wealthy. Money saved is money earned. Another avenue to obtain affordable medication is to go the generic route. As mentioned earlier, generic medications have similar compounds as brand-name, but cost significantly less. Though active ingredients in generics are considered to be bioequivalents of their brand-name counterparts, there can be variations in the inactive compounds (fillers and binders). Generics are not identical medications to brand-name medications. So it’s crucial to discuss with your prescribing health-care professional if a switch from brand-name to generic is a feasible idea. Professionally speaking, I’ve seen many patients swap with ease from brand-name to generic, while others didn’t manage so well. Where as little or no side effects were seen with brand-name antidepressants, the taking of generic equivalents for some of my patients resulted in many new complaints — headaches, stomachaches, and worst of all, insufficient reduction of depressive symptoms. A swift return to brand-name medication brought back the needed equilibrium and well-being. I think we’d all agree that feeling better trumps saving money. Report complaints regarding your health care. Before you lodge any complaints or queries, know your health-care coverage. This means reading through paperwork or accessing information online to learn exactly what you are entitled to receive. If you’re in a depressed state or in a compromised mood, have someone explain the details of your health plan to you. Keep a folder on all your health-care issues. Create a main folder — be it old school with paper and pen, or geek chic with a computer file — that includes all your medical records. Medication, treatments, reports, and so on should be included in this folder for easy access. Start a journal record of your contacts. Whenever you make an inquiry regarding your health care, record every contact you have and with whom you speak. This keeps a running tab of the calls you’ve made, emails you’ve sent, and the information you’ve received. When speaking to anyone, get her or his full name. Ask the customer representative to spell his or her name for you — first and last. Get a direct telephone number if you can. Sometimes you might not get the rep’s last name or direct line, but it sets the stage with whomever you’re speaking that you are a skilled consumer. Get the customer representative’s title. “What is your job title? And what exactly are your job responsibilities?” Requesting this information tells the customer representative that you wish to know exactly who he or she is, and grounds the conversation in a professional and polite tone. Ask why your claim was denied. Sometimes health care denials or late processing of claims are clerical errors. This is usually an easy fix. Other times, coverage may be delayed or denied due to “medical necessity.” In these instances, request a formal review and follow the procedures therein. Access outside agencies to lodge complaints or arbitrate on your behalf. If everything described above fails to work, this is the time to seek appeals outside of your healthcare program. DO NOT WAIT. Again, if you’re feeling overwhelmed by this process, reach out to a family member or friend to help you navigate this course of action. If you have the dubious honor of living in the United States, you can read further on things your insurance carrier doesn’t want you to know at insurance.com. It’s a bewildering account of the totemic power of money and the callousness of private enterprise. I will summarize five key issues reported by Dr. Linda Peeno, former medical director of a managed-care company and healthcare whistle-blower. Health carriers don’t want you to know how to access your benefits. Have you ever called to inquire about a claim or coverage only to get different answers along the way? That’s because the health insurers create a maze in which they hope you get frustrated. Feeling helpless, they hope you’ll give up and not pursue issues further. Denying you care keeps money in their accounts. And money in their accounts balloons their profits. It is more cost-efficient to let you die than to treat you for a serious condition. Health-care companies can get into legal trouble for denying you proper care. The ugly truth is that they don’t deny care but they deny payment of care. This deceptive process sends your claim into “pending” purgatory. Remember, denying you payment boosts their profits. Health-care companies find “technical” denials to delay paying you money. Waiting for a reimbursement, but it never comes in the mail? Have you called to inquire as to why you haven’t been paid only to be told that there is “missing” or “wrong” information on the claim? This is done so intentionally to delay your payment — and thousands of others — so the health-care company’s money can earn interest in their accounts. Health-care lingo is used as a tool to deny coverage. The terms “medical necessity,” “urgent,” “emergency,” and “evidence-based” are used by health-care companies to make denials stick. Often, denials are crafted by using these terms in such a way that your present symptoms or illness won’t qualify for coverage. Health-care companies use ghost networks. Have you called a health-care professional “in your plan” only to discover that this specialist is not a participating provider? Have you found yourself feeling disgusted from this experience, deciding not to go further? Consider yourself haunted by a ghost network. A ghost network, also called a phantom network, is a collective list of health professionals and specialists that your insurer insists are contracted providers for your medical or mental-health needs. However, these identified individuals are not members of the network. Remember, the goal of most insurance carriers is to take your money and limit your coverage. However, don’t let these ugly truths get you down. Your defeat signals profits for health care carriers — and you can’t let them win. Instead, arm yourself with knowledge, resources, and tools to get what you deserve. Experience is a great teacher, and man, do I have experience with health-care insurance companies. Professionally, I’ve been part of a ghost network and have seen patients experience delayed claims and denial of services. I’ve been told I filled out claims wrong when I didn’t, and have seen health care lingo deem suicidal behavior not an emergency condition. Personally, I’ve had to fight to get services, medication, and treatment many times over. Instead of getting discouraged, these negative experiences spur me on. The following are tactics I use and encourage you to do the same. Fill out every section of a claim form. I’ve learned over the years, personally and professionally, to fill out every inch of a claim form. Though it’s not always necessary to do so, it ensures that “nothing is left out” — a classic delay tactic health organizations use. Consider sending claims via registered or certified mail. To ensure that your claims are “received,” it may be worth the extra money to send them through the post with a signature guarantee. This postal strategy officially documents that your claim has been delivered. It also begins the time clock as your insurance carrier has a deadline to return your claim. Sending your claims via registered or certified mail makes it harder for them to say there is no record of your claim or it wasn’t received. I make copies of every claim I submit personally and professionally. If an insurance carrier says that there’s missing information or it’s filled out incorrectly, I pull out my copy and challenge the so-called error. Then, I kindly inform them that I will be contacting the state attorney and insurance departments if the claim is not cleared for payment immediately. This is when having the claim representative’s name and the date, time, and content of the discussion makes for good use. No one wants to be the responsible named party in a lodged complaint. Know your state attorney general. Every U.S. state attorney general has a health-care bureau or department where you can file a grievance and have him or her work on your behalf to fight insurance companies. Be prepared by having your state attorney general’s name and contact information when you call your health-care carrier. Inform the customer representative that you’ll be seeking the help of the state attorney general — and follow through if your situation is not remedied. Know your state insurance department contact information. Every U.S. state also has an insurance department where you can seek guidance and lodge a formal complaint. You should also have this information at your fingertips when you query your insurance carrier. Remember, follow through and file your complaint. Don’t make hollow threats.